South Africa has a great diversity of religions and the constitution states that all people have the right to freedom of religion and belief. The constitution also states that people have the right to establish independent educational institutions, which provides room for independent Christian schools to maintain a specific Christian ethos. 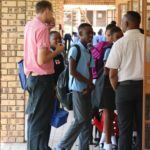 Jabulane Christian Academy was established in 2004 with the aim to provide quality Christian education to the children living at Bethesda. In 2007, we opened the doors to children from the community which provided the opportunity to reach out and serve families in the community with the Gospel. 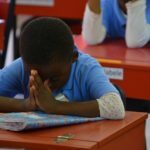 Providing Christian education addresses different developing areas of children’s lives and shapes them academically, spiritually, in their worldview and skills. Developing skills in children is important to helping them reach their God-given potential and using their talents. Being a Christian school means developing children’s minds and helping them grow academically, without distancing God from academics. Christian education promotes a worldview in which God has His rightful place. It is more than just teaching academic material through the lens of a Biblical worldview, for example, reflecting God’s truth on evolution in a science textbook. It also involves the holistic development of a child and shaping their character. Teachers encourage children’s spiritual development in an intentional, nurturing way. Attending a Christian school doesn’t mean children are suddenly without sin. It is a place where sin is recognised as sin and is dealt with using Biblical guidelines of repentance and grace. It teaches children to deal with things the way Jesus taught us. As principal at JCA, together with my team, we aim to be encouraging role models to our students, and we realise we are merely God’s instruments who are given opportunity to build into students’ lives, guiding them in the discovery of Truth and, according to John 14:6, Jesus is the way and the truth and the life. When students grow into disciples of Jesus, families, communities, cities and even nations are impacted!